Cafe Zoe is located inside an old Mumbai Mill compound like much of the Phoenix Mill compound at Lower Parel. Entry to the cafe is not easy to find and needs to be negotiated through meandering lanes crossing several eateries. While trying to locate the café, serious doubts start creeping into the mind about the quality of experience. Once one enters, the chic, industrial feel is reassuring. The café is obviously popular, going by the buzz and full house in the middle of the day. Almost as soon as we sit down, we notice two tables being upset with the service, which as we later realize, is slow and distracted to say the least. The drinks menu with fresh fruit looks enticing, and our hunch is right. Fresh Kiwi Margarita (Rs 530) and Black Grape Mojito (Rs 480) both are delicious and just what is needed in this hot, muggy Mumbai weather. Beef Carpaccio (Rs 410) starter is simply superb. As one is to realize soon, beef/buff is what this restaurant does best, and it is a good idea to stick to the “red” dishes when looking at carnivore dishes. Prawn Caesar Salad (Rs 250) is ordinary. In the mains, the chicken entrée has to be sent back because it is hopelessly overcooked and stringy. Seared John Dory (Rs 750) does not do much better either. It is dry and overcooked and not enjoyable. The redemption moment comes with the Really Great Beef and Bacon Burger (Rs 610) which lives up to its name by having a juicy and moist patty, crispy bacon and a burger bun that does not disintegrate. 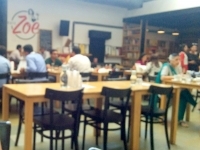 Cafe Zoe is a nice happening cafe with interesting drinks and a great burger. Visit this café for these two.